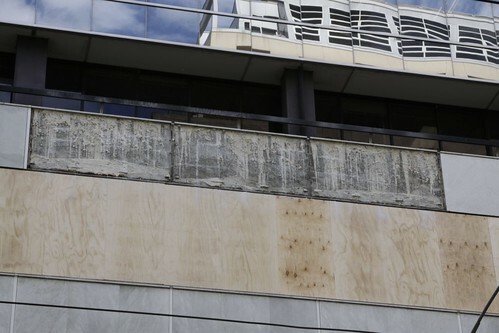 I have previously written about the former National Mutual Plaza building located at 447 Collins Street in Melbourne, but on January 30 it scored a mention in the local news when a one metre by two metre sized marble panel fell from the northern facade to the plaza below. One of around 1,200 panels that clad the building, thankfully no one was injured when it fell to earth around 11am, with the plaza being relatively empty at this time of the morning. 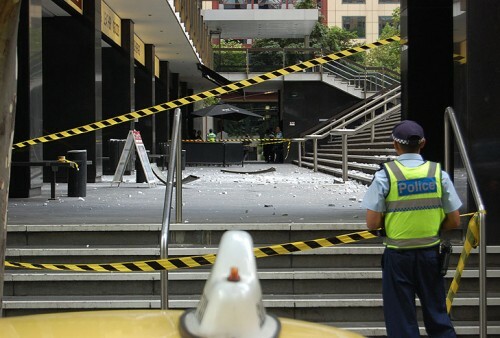 This photo below (by Andy Park of The Age) shows the resulting rubble that covered a large area of the plaza, the panel having been propelled away from the wall on impact with the balustrade on the level below. 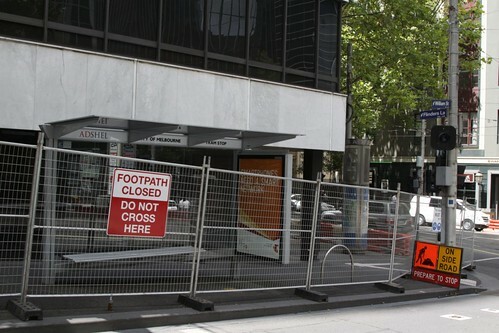 In the aftermath of the fall the City of Melbourne issued an Emergency Order requiring the surrounding pedestrian areas to be cordoned off. 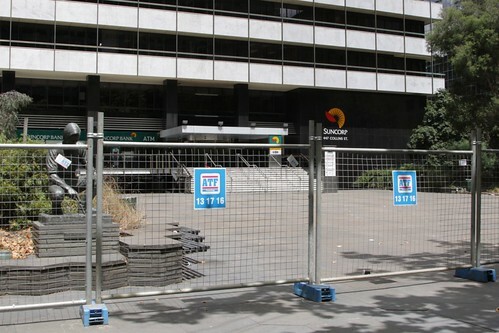 Within a few days temporary fencing had been erected along the footpaths surrounding the entire building – occupying the city block bounded by Collins Street, William Street, Flinders Lane, and Market Street. 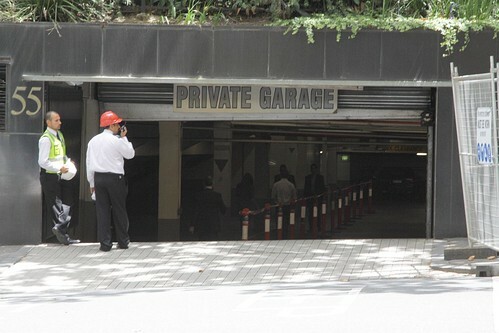 With the main entrance on Collins Street closed, all tenants of 447 Collins Street have had to access the building via the Market Street carpark driveway. The Emergency Order also required a structural engineer to inspect the building to determine what remedial works may be needed. 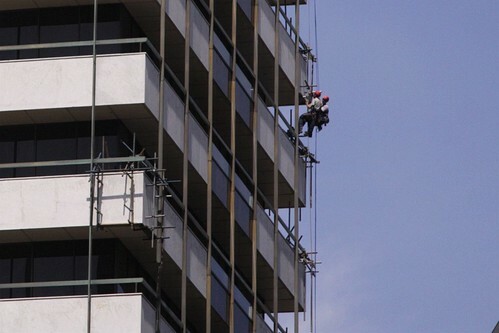 From February 1st abseilers were inspecting the side of the building, checking up on each of the facade panels to see if any more were loose. 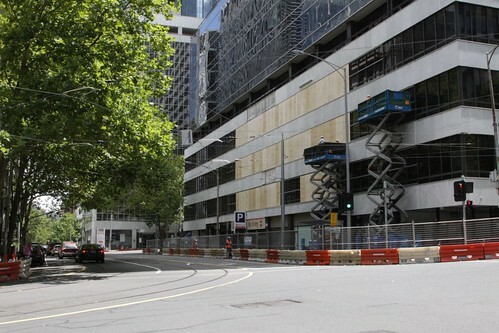 Along the Flinders Lane frontage much more intensive work has been undertaken, with all of the exterior windows being covered with plywood sheets. With the windows here being flush with the marble panels, the workers have been gaining access to the facade with scissor lifts, bolting ‘top hat’ steel channel running between the vertical window mullions, which provides a base for the plywood. I’m not sure what purpose the plywood is intending to achieve, but a number of marble panels on the Flinders Lane frontage have been removed. 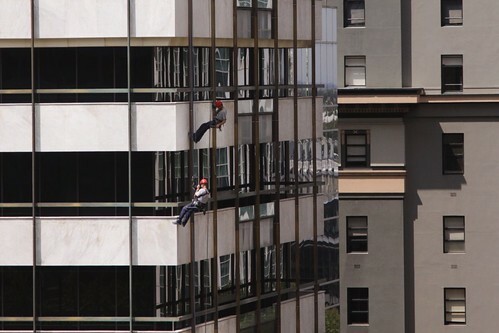 Perhaps they don’t want the abseilers bashing their feet on the windows all day? 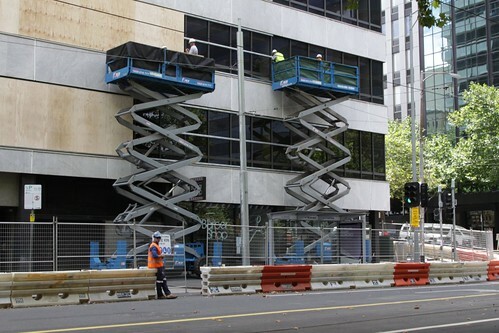 By February 10 some remedial work has also commenced on the upper levels of the building, with scaffolding being bolted over a selection of facade panels, presumably to hold them in place after the inspection works found they were loose. 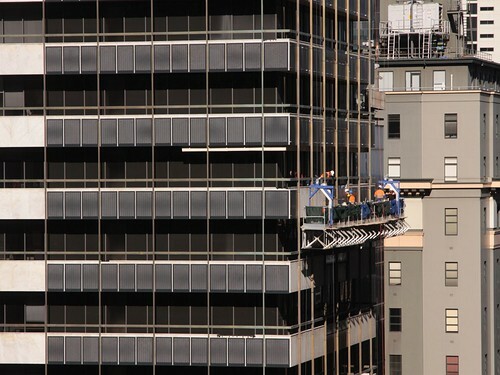 Access to the panels on the upper levels is achieved in two ways: workers walking along the exterior balconies, and abseilers handing down from the roof. 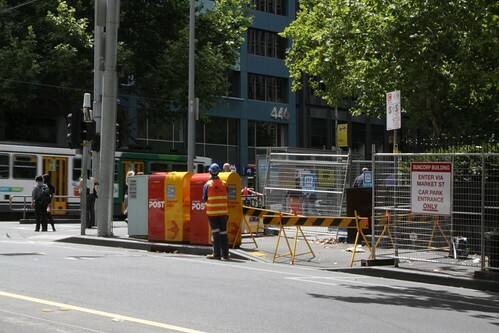 Two weeks after the panel fell, I am now wondering how long the rectification works will take, and whether more permanent gantries will be erected over the surrounding footpaths to restore a bit of normality to the area. Tenants yet to get compensation guidance after emergency closure of Collins Street office building, an article from ‘Property Observer’ by Alistair Walsh. 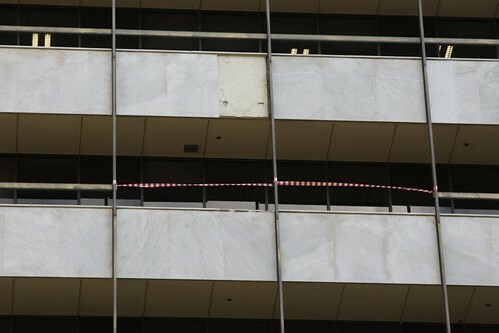 The June 22 edition of The Age had an article titled ‘Sky-high cost for falling marble facade. It now appears that the rectification works have been completed, with about 40 per cent of the facade now clamped to the building to avoid further marble panels falling. In addition tenants have been slowly moving out of the building, with the last to leave by mid-2013, allowing the owner ‘Industry Super Property Trust’ to carry out permanent repair works without disruption. It appears that the permanent repair works are the installation of steel mesh sheets to each of the marble panels, in order to contain any future loose debris. Work has started on the north-west corner of the buildin. 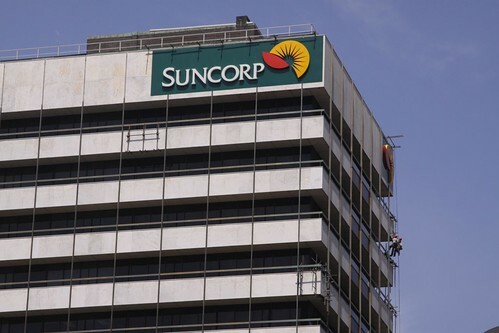 The owners of the former Suncorp office building on Collins Street have applied for a permit to destroy the 27-storey tower, which has sat empty since 2012 when slab of the building smashed to the ground of the forecourt. A council report to be tabled next week has called for the permit to be approved, despite the fact they have previously recommended the site for heritage protection. That advice was rejected by Planning Minister Matthew Guy last year, subject to further review. If you would like another case study for facade issues two good buildings are Nauru House (80 Collins) which suffered from concrete sprawling (aka “concrete cancer”) but also Royal Melbourne Hospital had issues with mortar failure and bricks “popping” from the facade. You can see the permanent rectification method in this link… http://maps.google.com.au/maps?q=grattan+st+parkville&hl=en&ll=-37.798942,144.957604&spn=0.001717,0.002411&sll=-25.335448,135.745076&sspn=61.791575,79.013672&hnear=Grattan+St,+Parkville+Victoria+3052&t=m&z=19&layer=c&cbll=-37.79888,144.957612&panoid=WWCk1uU28VSe6O7k6P0SBw&cbp=12,274.75,,0,-15.02 essentially a black mesh screen to retain the facade. I remember seeing Nauru House back in the early 1990s when it was still pebblecrete, and later seeing it in the process of being reclad in aluminium – there is more detail about the work here. The issues at the Royal Melbourne Hospital are interesting one, as the original buildings there date to the 1940s – it’s hard to see much of the brick buildings from the street due to the later extensions on the site.